engaged for over an hour. One could talk for hours about the attention span of children, or the lack of it. Parents tell me their children have a long attention span, they can watch TV or play video games for hours. Yet, the same child cannot stick to a school task for more than a few minutes. My 15 month old grandson can play the same toy telephone game far longer than I am entertained by its repetition. Who has the long attention span? For the record, watching TV does not prove a long attention span. On the contrary, there seems to be some evidence that TV’s fast pace actually leads to increased incidence of attention deficit disorder. It is more hypnotic, meaning that the mind is not engaged, leading to children who find it difficult to engage in school activities. So, how do we help our children develop long attention spans. We actually need to do very little. 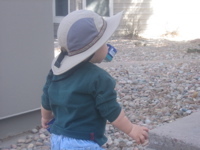 Toddlers who are allowed to spend time watched-over but not directed, will move, at will, from one activity to another. They will examine until satisfied or distracted. Occasionally, they will become engaged. When you see that happen, make sure you do not distract them. Let them get their fill. Recently, I took care of my 15 month old grandson. He is active and inquisitive, into everything, and has an attention span from about 10 seconds to one hour. It depends on what he is doing how long he will stick with it. That is no surprise. It is true for adults also. If we are interested, we are persistent. If not, there are a hundred other things to capture our interest. 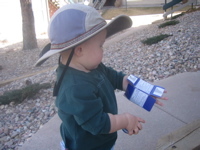 Coming home from the grocery store, he discovered the Vicks VapoRub, a small, blue, plastic jar inside of a blue box. He found it enthralling. It took him about 10 minutes to get the box open. He spent at least 20 minutes putting the jar back into the box and experimenting with how to get it out. 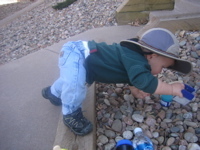 His favorite was shaking the box so hard, the jar went flying into the rocks in his yard. He spent a while trying to carry both in one hand or the jar in his teeth. He discovered that the jar could roll down the hill and he was pretty sure the lid came off but could not figure out how. Eventually, the box was broken and he began tearing it up. Was his time well spent? I think so. 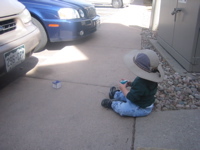 He learned about the properties of materials, geometry, physics, function, cause and effect, and autonomy, all through play without adult direction or distraction. Later that day, he spotted my little blue jar and was ready for more fun.